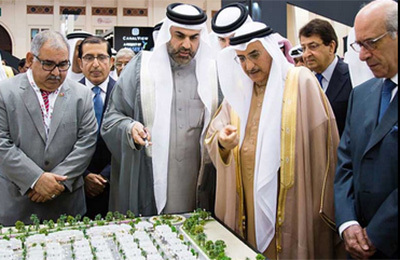 Bahrain’s Deputy Premier and Faqeeh at the expo. Bin Faqeeh, a privately-owned real estate investment company, has announced the launch of its latest real estate project Alsidra, located at Diyar Al Muharraq in Bahrain. Alsidra is a luxury gated community and the project’s various facilities, its strategic location and affordability combine to make it a unique property development that caters to expatriates and locals alike, the company said. The project, valued at BD85 million ($223.67 million), is scheduled to be completed by the first quarter of 2019. The community will have 465 villas of varying designs and sizes, ranging from two- to five-bedroom units. The project will feature a harmonious balance of ‘regional-meets-modern’ design themes. Alsidra presents a unique concept of blending regional Bahraini, Moroccan, modern (two types) and contemporary designs that offer a plethora of choice to interested buyers. Each villa comes with a garage that has space for two vehicles, living quarters for the help and a laundry room. Certain signature villas will have a personal swimming pool. The common facilities include fountain concepts and a flamingo park adorned with majestic flamingo statues at the ponds, which is complemented with several unique themes for the seating areas. The property was officially launched at Bipex 2016, Bahrain’s leading property show where Bin Faqeeh was the prime sponsor.